Developing countries have signaled increasing frustration with the failure of the US Congress to ratify an agreement made in 2010 to reform the quota allocation in the IMF (see Update 79), which would increase the voice of developing countries in the governance of the Fund. European nations still retain over 30 per cent of the Fund’s overall shareholding, despite collectively representing less than 20 per cent of the global economy. The upcoming IMF and World Bank annual meetings, to be held in October in Lima, Peru, represent the final opportunity for the world’s finance ministers to gather together as the IMF’s board of governors before a deadline set by the IMF’s own executive board for a comprehensive resolution. US Congressional approval is required to ratify the 2010 IMF quota reforms. They would create an all-elected executive board with increased representation of developing countries and double member countries’ quotas, thereby enabling the Fund to respond to growing financial crisis risks by doubling its financial resources. The India-appointed IMF executive director (ED), Rakesh Mohan, indicated in September that bypassing the stalled reforms is now increasingly likely. Mohan, who represents the constituency comprising India, Sri Lanka, Bhutan and Bangladesh on the IMF’s board, Speaking to news agency Reuters in September Mohan said that there was more openness to “ad hoc changes like we did in 2008” to “increase the shares of … countries that are most under-represented [such as] China [and] India”. The September G20 meeting reaffirmed in its communiqué that the “earliest implementation” of the IMF reforms is “essential for the credibility, legitimacy and effectiveness of the Fund and remains our highest priority”. The 2010 agreement included an interim (until ratification of the reforms) increase in the IMF’s financial resources, provided principally by developing countries. The subsequent, 15th, round of quota reform is now itself overdue. A deadline of December 15th 2015 was recommended to governors by the IMF board in January. This called for the full resolution of the overdue quota reform processes, accepting the need for “interim steps”, however these “should not in any way be seen as a substitute for the 2010 reforms”. This deadlock has contributed to the emergence of alternative institutions, such as the New Development Bank. Its founding member states, Brazil, Russia, India, China and South Africa (BRICS), explicitly cited their lack of relative representation in the Bretton Woods Institutions as a motivating factor to develop their own alternative development bank and financial crisis fund, the Contingent Reserve Arrangement (See Observer Spring 2015). Despite indicating a preference for a comprehensive solution, the Brazil-appointed IMF ED Otaviano Canuto told news agency Reuters in early September that an ad hoc, interim solution was what he “probably” expected to happen. Canuto also indicated that as yet no board discussion on potential interim steps had occurred. Jacob Funk Kirkegaard, of US-based economic policy think-tank the Pietersen Institute, suggested that these public statements are designed to “signal to the [US] administration and Congress that the world is ready to proceed without them”. In a January briefing for the Pietersen Institute, former assistant secretary of the US Treasury for International Affairs, Edwin Truman found that $1.25 to $1.5 trillion is “a conservative estimate of what will be necessary to carry the IMF through the middle of the next decade”. 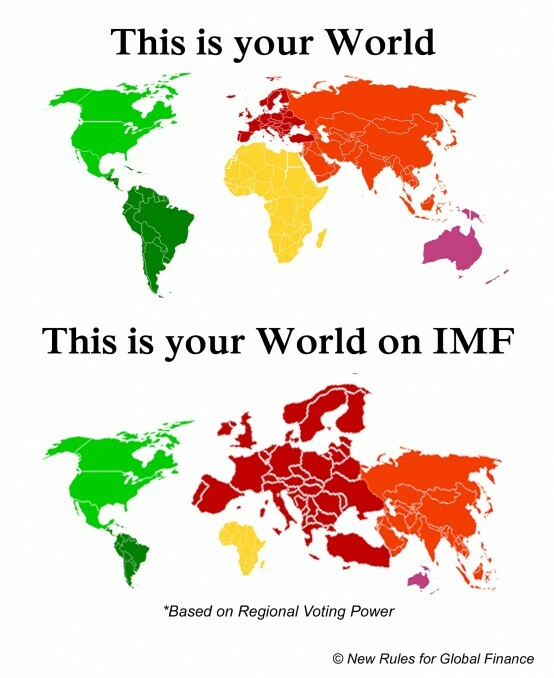 Changes to increase individual states’ quota would automatically reduce the relative shareholding of all other states, including the United States whose 16.74 per cent quota provides it with an effective veto on all major IMF decisions, which require 85 per cent of total voting power to ratify key decisions. An alternative interim step, advocated in April by the prior Brazil-appointed ED, Paulo Batista, to “de-link” the resourcing of the IMF from board and quota reforms would also have led to a temporary end to the US veto, and was not taken up by the IMF in any policy papers addressing the potential reform paths. Bank’s cyclical shareholding review going in circles? In 2010 the World Bank’s shareholders agreed to five-yearly shareholding reviews. The 2015 review was intended to be completed by the October annual meetings. This followed a 2008 agreement to ensure, without a specific deadline, that 50 per cent of the Bank’s voting power would be held by developing countries (though this included states such as South Korea and the Czech Republic). Also in 2010 a 25th ED representing an African group of countries was added to the board. In April, the ministerial body overseeing the World Bank Group and IMF, the development committee, stated in its communique that it attached “great importance to these regular reviews” and that “we look forward to further work by the Board on the 2015 review and commit to its completion by the time of the annual meetings in October” (see Update 86).